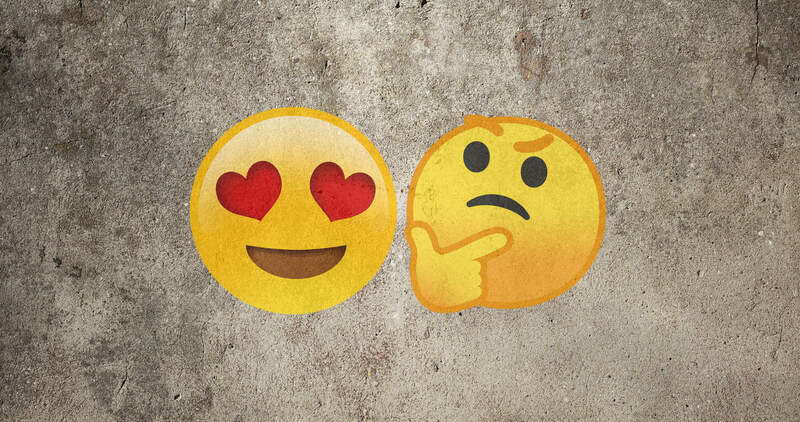 5 Things That Are Hot and Not About Destiny! The "5 Things That Are Hot and Not About Destiny" is our regular weekly segment here at the YOUR Destiny website and meant to be a column on what has been going on, either, in Destiny generally, or in the head of the columnist specifically. The column will be written by our resident writers and their opinions are obviously just opinions - you might disagree, heck, we'd almost be disappointed if you don't disagree! Feel free to participate in the discussion on our Facebook Page! 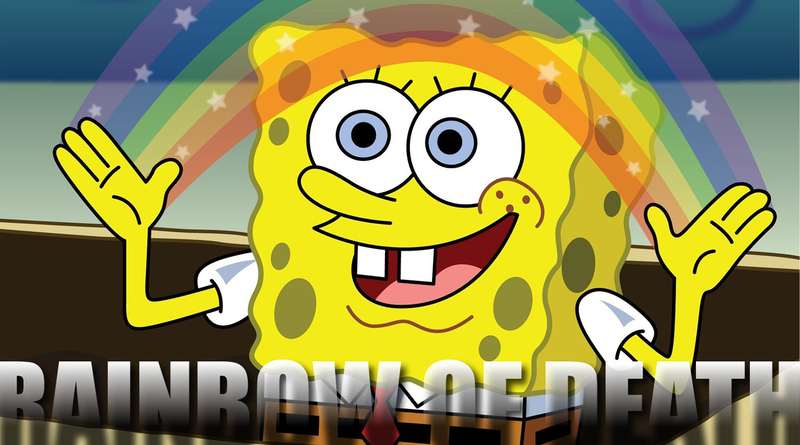 In today's column we are looking at "5 Things You Should Do When Demo'ing Destiny" ... Perfect time to start getting new players into the game! 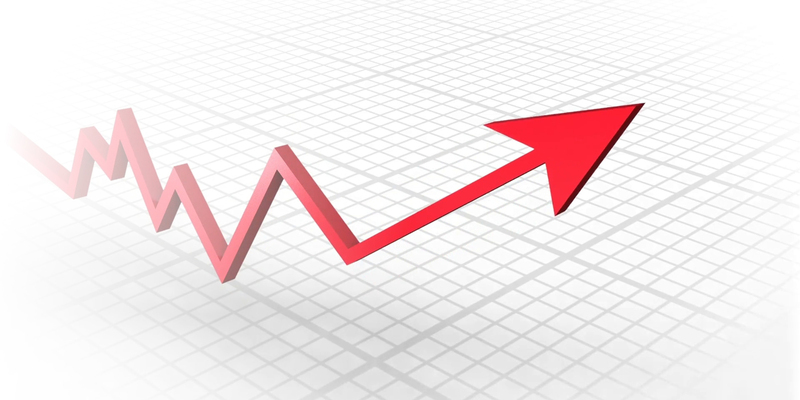 Perfect time to get your demo games right! 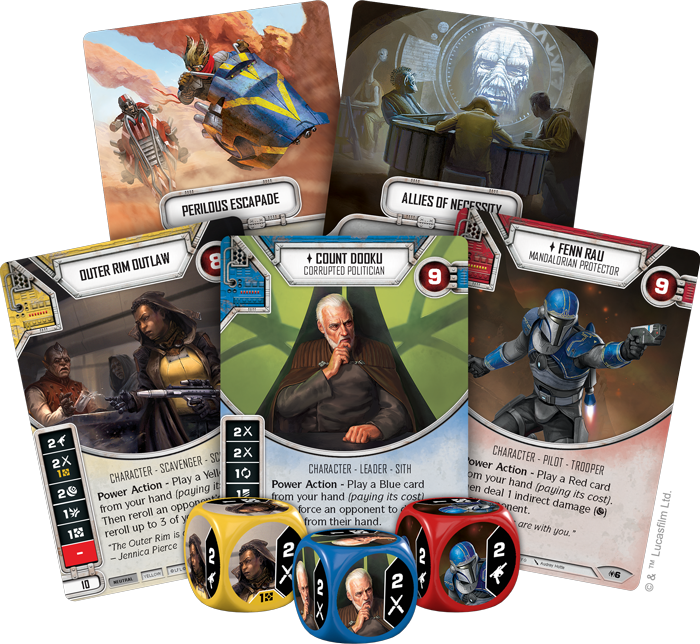 Judging from the MANY comments in various Facebook groups and other social media, Star Wars Destiny players are generally ecstatic with joy over the promises to the game that rotation offers! Refreshing the card pool has also given the design team a much needed space to affect the game without banning or errata'ing cards and has paved the way for the possible influence of their new design ideas including the "subtype" or "tribal theme". It looks to already now have won many players over with quite a lot of the decks I've browsed through on swdestinydb or created myself relying heavily on that particular design space (we also recently released a deck analysis of ePhasma/Piett that does exactly that). If this website can be used for any kind of indication of the general interest in Destiny, then we've generally observed a peak in interest, and I'm certain we are not alone in this positive tendency, which probably both stems from a renewed excitement for the game, but also from former players getting back in while they are followed by brand new players! Exciting times and I'm certain rotation has a major role to play in this great development! We also hear rumours of local playgroups being revitalised and seeing more new players join the ranks! HUZZAH! First of all, having the Holocrons firmly in place before the first premier tournament, the Galactic Qualifier in Milton Keynes (UK), that will be played with the new card pools is great. 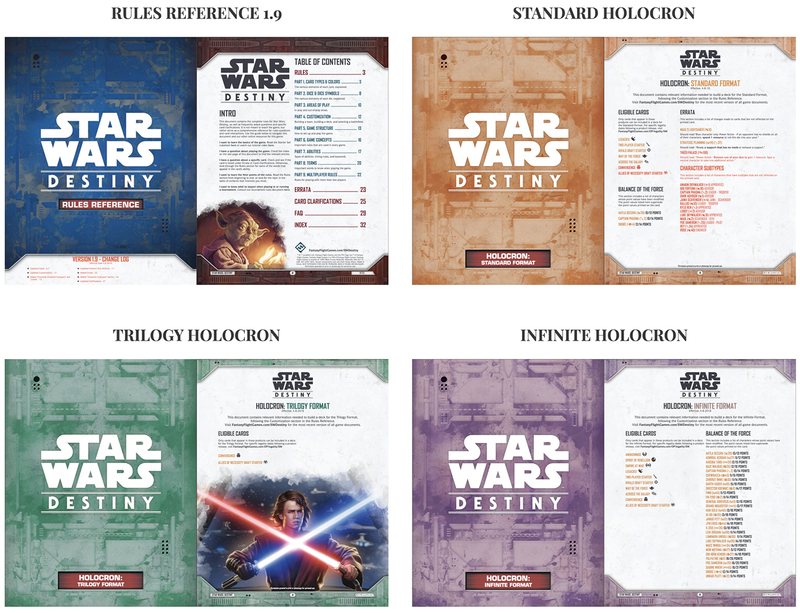 Also, it felt like the rules team were fast and proactive in relation to the issues that were not covered by the Rules Reference 1.9 and the Holocrons by releasing them on their official rules clarification forum, in stark contrast to the misery surrounding the release of Across the Galaxy just weeks prior to the French Nationals 2018 with questions concerning the infinite combo of Qui-Gon Jinn and Qui-Gon Jinn's Lightsaber left in limbo until the eleventh hour (remember that)! While there's still plenty of time to find broken stuff, it does feel like the team has been proactive and responsive, which is a huge deal - especially for those playing competitively (although a relief for all). 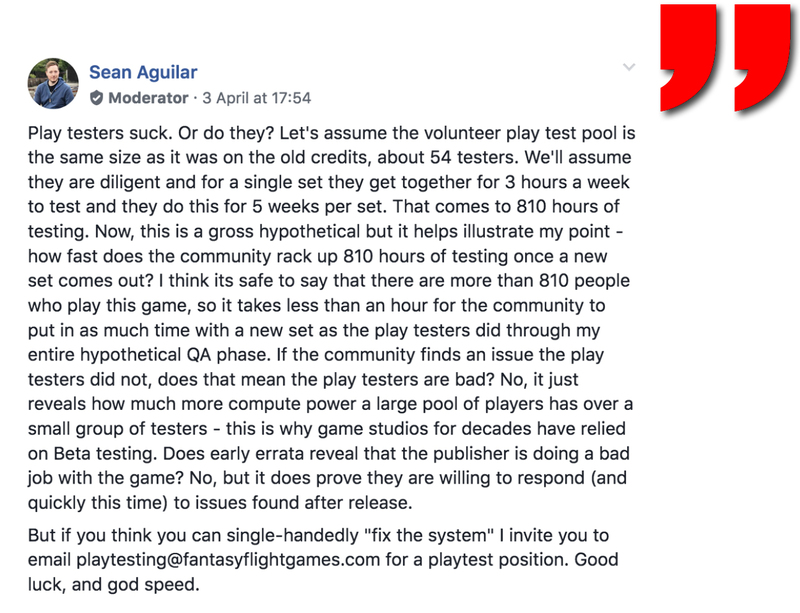 And as a cheeky reply to those who believe that play testing is easy or that playtesters should/can catch up on everything, Sean Aguilar aka Pearl Yeti of the Artificery Crew published the above post recently on the Star Wars: Destiny Facebook group! I agree ... even if I don't always ... agree! "This thing is going to be the workhorse for every Yellow Ramp deck until it rotates out or gets nerfed. I think if the 2 Resource sides was a single Resource then things would be fine, but if someone jams it and tutors up the other one, then resolves 2 Resource side and another resource to play the 2nd and grabs Fickle Mercenaries or Hired Muscle, then things are going to become REAL REAL BAD… REAL REAL FAST. I like to think of Vader’s Fist, Megablaster Troopers, and Entourage as the new Trifect for Villain Ramp decks"
Couldn't agree more. Having had some games in with and against Entourage, it's pretty damn nasty! We already know how powerful tutors can be, but tutoring for another card, which is also a tutor, which in turn can tutor for a third powerful support is just outright mad. It would actually have made sense to put Entourage in the "NOT" section of this column, but I just can't help being overwhelmed at how powerful it actually is ... HOT damn! Followed by ... Hell NO! It's like those YouTube videos you really shouldn't be watching because they are horrible, but you just can't take your damn eyes off them (after having finished watching them, 3 or 4 times, you can always go: I DISLIKE!). The Galactic Qualifier in Milton Keynes is going to be massive. MASSIVELY ANNOYING (see later) and MASSIVELY EXCITING! I'm excited for the Galactic Qualifier because it's going to be my first premier event for months - and I do enjoy competitive games of Destiny, but I'm also excited to bunk up with a bunch of awesome Destiny players from the UK and allegedly sharing a tiny bed with several of them (looking forward to that), and generally meeting up with friends, old and new, as well as say hi in person to patrons who so graciously support this website. 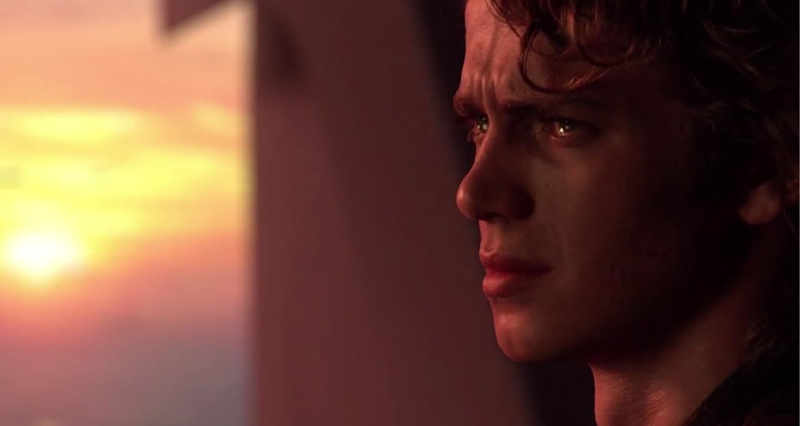 Whenever I'm considering putting an end to content creation for Star Wars Destiny, mostly due to my fairly restricted time and family obligations, it's the community surrounding this game that keeps me going. Generally people playing Destiny are just AWESOME folks, and the YOUR Destiny patrons specifically, who so generously give us their support, deserve more credit than I can ever give them! THANK YOU! I'm honestly looking more forward to meeting you guys than playing in the tournament (... and you'll see some of the reasons why later in this column). 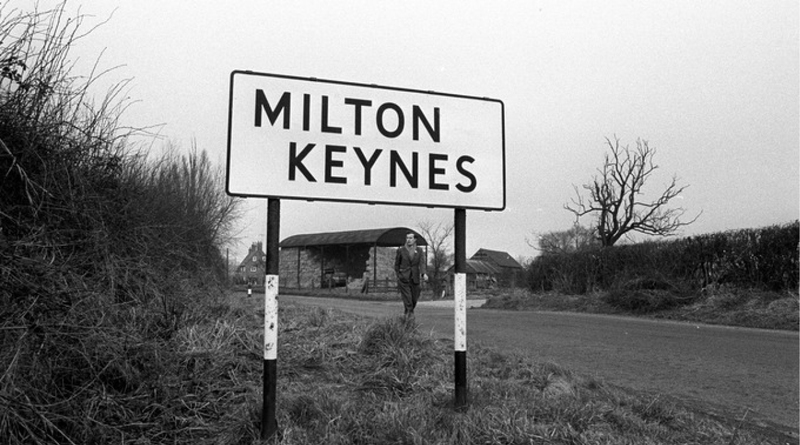 Milton Keynes is also rumoured to be a place of astonishing beauty - so I've heard (actually I haven't ... but I'd like to think so). And I'm ready to get disappointed. It's not long ago that the only monocoloured decks that really did well were monoblue decks. Lightsabers and woo-doo magic from a more civilised age could occasionally rule the Galaxy. All other monocoloured decks perished before them or in a haze of rainbow terror. I distantly remember playing monored heroes in a day and age when our binders were less dense than they are today ... but that's been a trap for a long time. Could Convergence and the hallowed rotation that came with it be the beginning of a golden age for monocoloured decks? Are we going to see viable competitive decks with ePhasma/FO/Advanced Training, Grievous with an army of Droids or a scoundrel pack of Marauders led by Nefys Nest? I'm not saying that rainbow decks are not still going to be at the top of the meta, because they are in prime position to be so! They are built to succeed with access to every single card in the eligible card pool. But we might start experiencing a change to rainbow decks utterly dominating the monocoloured alternatives and see the gap between them bridged by synergies offered by monocoloured decks centered around various subtypes. 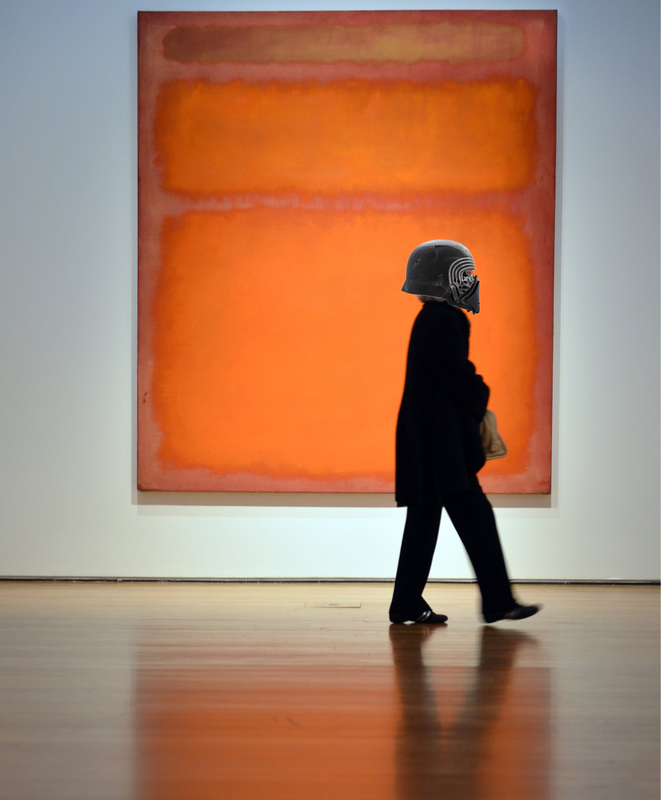 You can understand why Kylo Ren looks so amused as (s)he strolls by this monocoloured'ish painting with a dash of grey by Mark Rothko, which was sold for $86.900.000 in 2012 ... NUTS! It's kinda annoying not knowing when to arrange for a local event or tournament because you have no idea when the PRIZE KITS are going to arrive. In Denmark, and many other places I've been told, stores are still patiently waiting for the Q4-kits, and First Seasonal Kits, to arrive, while orders have already been made for the Second Seasonal Kits. As I'm finishing up this article Alex Watkins, Global Director for Organized Play, actually answered a Facebook message I sent to Asmodee Nordic, the distributor for Denmark (amongst other countries), replying that both the Q4-Kit from 2018 (pictured) AND the Season 1 Kit for 2019 had been shipped from the US and are expected inbound any minute now ... YAY! It would still be nice to know in advance when to expect them though! On the other hand, and we've praised the new revamped Organized Play before, communication from the OP Department, Alex Watkins and Alec Thorne in particular, have improved VASTLY! That's HOT ... not getting the kits on time is NOT! 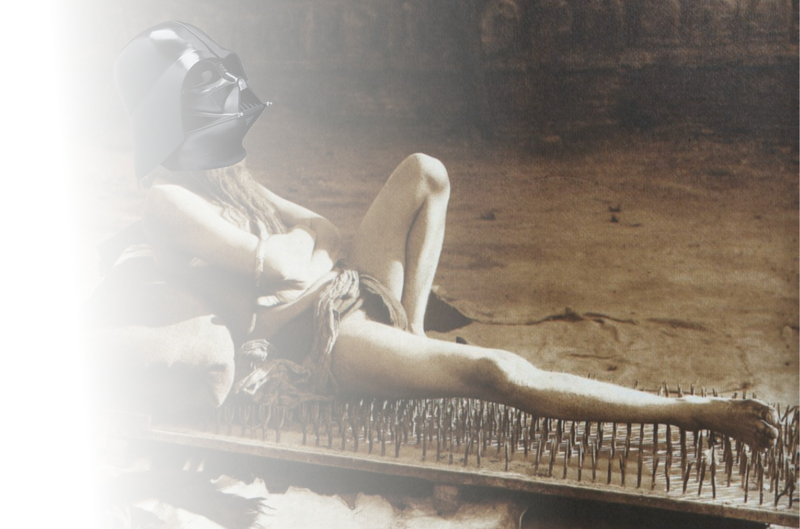 There was only one deck that ever made Crime Lord remotely playable and that was eUnkar/eThrawn and that deck was playable for something like 2 hours and then Unkar Plutt was nerfed to make the deck null. On top of that even in that deck Crime Lord was accompanied by Ace in the Hole, Friends in Low Places and Thrawn's ability to make for a gruesome combo that could potentially catch an opponent with no mitigation and ensure the defeat of a character! Today, there's no eUnkar/eThrawn in any format, there's no Ace in the Hole or Friends in Low Places in Standard, all that is left is the tattered remains of Crime Lord. 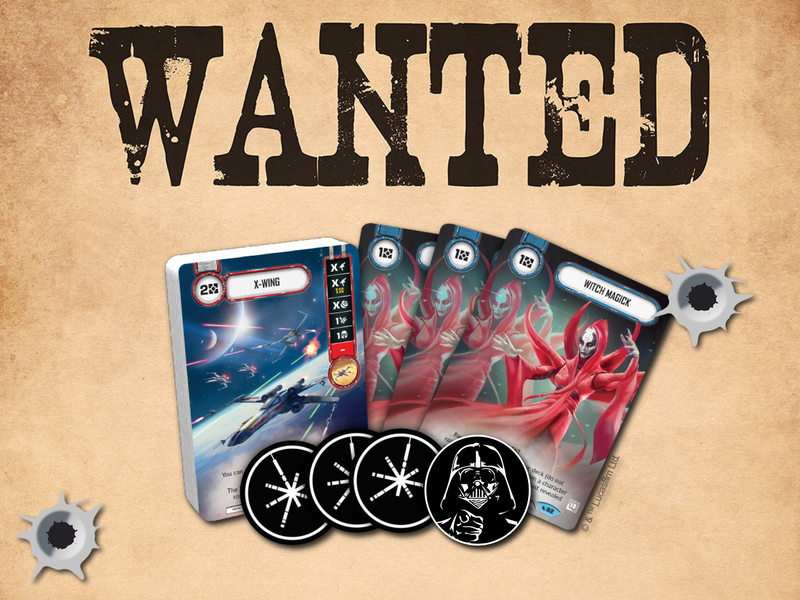 Screams 'as if millions of voices cried out in terror' were heard around kitchen tables as players pulled a Crime Lord amongst the sparse 6 Legendary cards per display. Some would say it is the condition of pulling cards from booster packs ... not me ... I blame Jeremy Zwirn: Personally! I pulled 3! 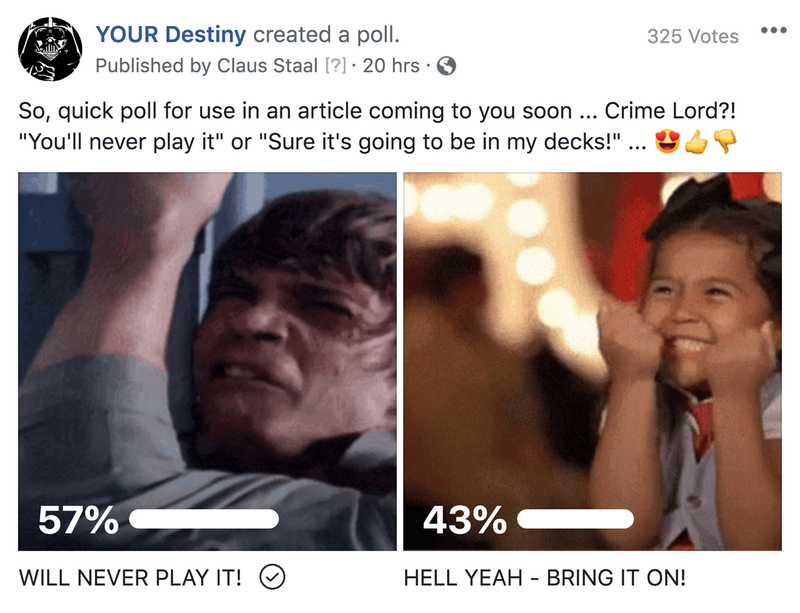 So, Just for the fun of it, I decided to do a quick and dirty poll on the YOUR Destiny Facebook Page, 325 people chimed in, and well ... the results obviously speak their own language: People are just lying through their teeth sheltered in the anonymity of the dark web! As if 43% of those people are going to play with Crime Lord. Nothing really excites me about Chewbacca! If they hadn't reprinted Crime Lord, scoundrel Chewie would easily be the worst Legendary of Convergence. At our latest gaming night a local player, I'll leave that particular individual unnamed here (you can thank me later), came up to me and said with excitement: "WOW ... Chewie's actually not that bad, he can really dish out damage. Chewie's Blaster hits like a truck" ... I'm obviously paraphrasing here since I stopped paying attention after the "... Chewie's really not that bad ...". The thing is that it actually says significantly more about the qualities of his Blaster than of Chewbacca himself. No one can doubt the quality of that blaster! Anything that allows you to roll in a die for "free" (well ... you take a damage, but I'll take that trade any day), possibly resolving it twice, is pretty good by most standards. 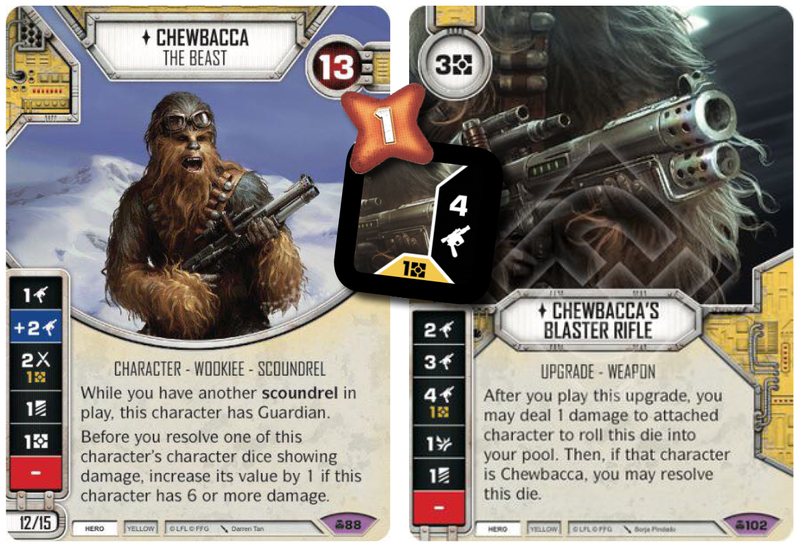 And although the synergy between the Blaster and Chewie is hard to miss, it's probably not worth bringing Chewie just for the action cheat. It can still work fine with other characters! For a 12/15e character his die is absolutely horrendous! It of course looks a LOT better once he's down to 7 health, but then he's down to well ... 7 health (and he's possibly running around with a very expensive gun). I'm not saying he'll never see play, because the love that surrounds the hairy behemoth is quite persistent. I'm just saying he's NOT good ... although his Blaster is. We can try and pry it from his cold dead hairy hands. 4. GOING UNPREPARED TO A GQ! The Galactic Qualifier this Saturday and Sunday (April 13-14, 2019) in Milton Keynes, UK is the first major tournament I've played in since Nationals 2018 in France quite some months ago (and the Regionals Season, but it doesn't really count) ... And I've never been less prepared for a tournament than this one. I need those damn spotgloss cards ... well ... NEED might be stretching it a bit, but they are going to sweeten up my life significantly (short term). It will be the first premier event with Convergence included in the new Standard Format, which means that it could be defining for how the early Convergence meta is going to develop. It is obviously still an untried meta, which means that it's going to be susceptible to significant change as more tournaments are clocked, but it will nonetheless be a strong indicator. It bugs me to be so unprepared, but life in general, which has a way of kicking even the best intended plans in the teeth, obligations in relation to this website as well as a good 3-week hiatus prior to the release of Convergence has seriously dented my preparations. It also bugs me because I'm doing a disservice to everyone else who did come prepared, but I do intend to go down fighting though, so do not expect me to roll over and die without resistance. I'm likely to roll over and die nonetheless, but I just don't want you to expect it! Being unprepared is annoying because it takes attention away from me being able to fully enjoy the event, but rather thinking about the games and match-ups during the event. Those things should already be settled by now! ANYWAYS ... 3 days to go! 0 decks made! I don't know if it was the plan all along or there was a mix-up in the release of Allies of Necessity, but not releasing it at the same time as Convergence feels like a huge mistake! The players in ASK Gaming Cafe opened close to 45 displays, if not more, and we would probably have done a few rounds of drafting if we had the new draft kit. It's going to be very difficult to convince seasoned players to draft with newer players when they already have their binders stuffed full of playsets of Convergence. I think Fantasy Flight Games would have be wise in releasing the base sets bundled together with starters and whatever goodies comes along. Now, I'm probably just going to open Allies of Necessity and throw it in with the rest of my cards ready for my standard brews! 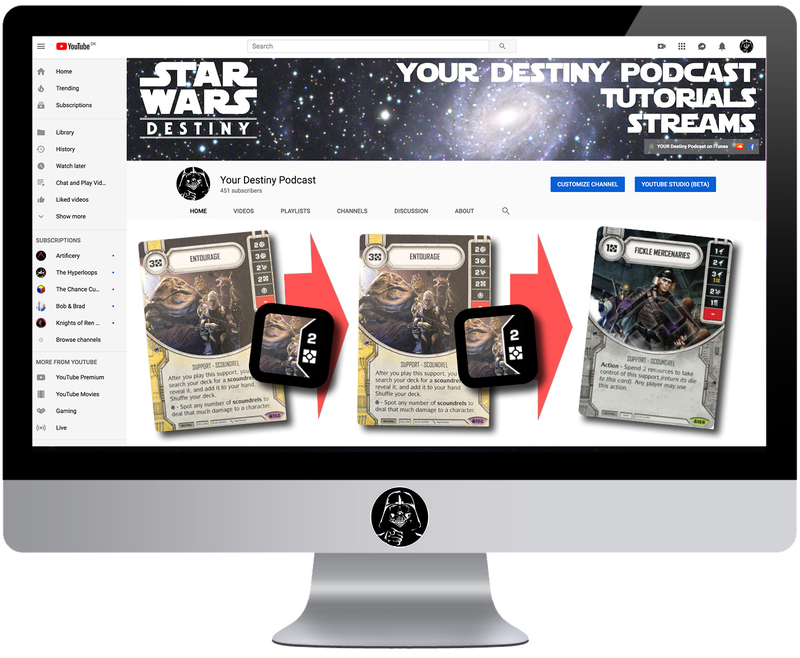 As a Patron you support the YOUR Destiny website, podcast and YouTube Channel, and you help us to continue providing content for Star Wars Destiny. We are a dedicated Destiny website and release articles almost daily. As Patron you can enter our Patron only Discord Channel as well as getting access to all our "Chat 'N' Play" videos, while Advanced and Expert tier patrons also get access to exclusive training videos and test videos. Thank you for your consideration! ALSO ... 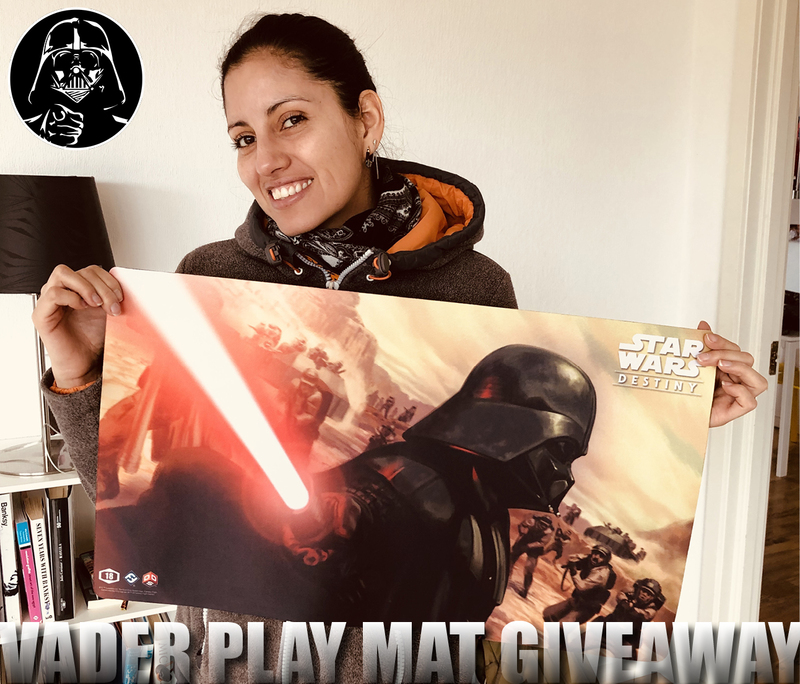 Patrons, remember our DARTH VADER MAT GIVE-AWAY. The competition ends on Friday April 12, 2019, and you can submit your entry on our DISCORD CHANNEL!